On New Year's Day, India's first 'unicorn' InMobi will turn 10 years old. But that milestone doesn't necessarily mean celebrations are in order, for it had a forgettable 2016, what with the failure of its discovery-led mobile commerce platform Miip, exodus of talent and a choppy mobile ad market. A company that once galloped through the sands of venture money now seems to be limping, and losses at the operational level are only compounding the problem. But there are green shoots too, such as the 15-fold growth that it has recorded in China, where the absence of Google Play gives it a serious shot at the highly fragmented Android market. Let's take a closer look at how 2016 panned out for InMobi. 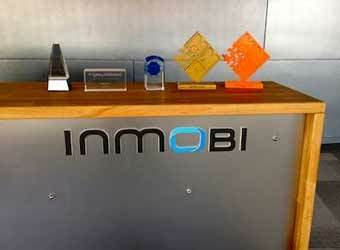 InMobi gets about 30% of its revenue from China. With 15-fold growth in three years and a 140% compound annual growth rate during 2012-2015, InMobi is the largest independent native ad network in China, claims the company. A total of 460 million smartphone users are covered by InMobi, accounting for 80% of all smartphone users in China. InMobi plans to invest $15 million (Rs 100 crore) in its China business in 2017 to expand in its fastest-growing market, its global head of marketing Arun Pattabhiraman had told The Economic Times in October. He had also said that the company had doubled its investments in China over the past two years, in terms of sales and operations. This year, InMobi launched its mobile-first, in-app remarketing platform globally across India, the US and Southeast Asia. It claimed that it saw mobile remarketing adoption soar 400% in 2016. The company said that all leading e-commerce companies in India use the platform and that it drives up to 7% of sales for them. Retailers, gaming, travel and entertainment companies across India, the US, Southeast Asia and China also use this platform, it said. InMobi claims that it witnessed 200% growth in mobile video ad consumption on the network, "as video-based storytelling became more popular with brands and marketers". InMobi's biggest bet in 2015 was the launch of Miip, which engaged users by suggesting products to buy across apps. Miiip, which had an animated green monkey as mascot, was launched in the US, with much fanfare. In 2016, the company discontinued the mascot function on the Miip platform. Many ex-employees, who talked to Techcircle on the condition of anonymity, said the product didn't take off as well as expected. A top-level executive, who resigned this year, said Miip's failure led to a loss of confidence in the company. "Inmobi has gone through a really tough 2016. With the funding scene drying up and the relative downturn in the mobile ad market, InMobi has some serious challenges to solve," said Manish Singhal, founding partner, pi Ventures. The loss of confidence in the company and its products led to several top-level exits this year, including that of finance chief Manish Dugar and Ankit Rawal, general manager for India. Other senior-level exits were those of Naresh Agarwal, vice president of engineering; Ravikiran Vadapally, vice president of finance; and Khushboo Gupta, who headed strategy for InMobi's app business. But the company has a different view on these developments. An InMobi spokesperson said in an emailed statement that, "80% of the executive team at InMobi has an average tenure of more than four years, which is a rare number in this industry. We also added 184 full-time employees in 2016, and our voluntary attrition rates are currently at 16%, much below the industry average." The company also said that it encourages employees who wish to start-up on their own... "A major chunk of them leave to begin their own ventures and the InMobi founders routinely counsel these companies," the spokesperson said. InMobi was the first India-based company that Japanese mega investor SoftBank invested in. But that was way back in 2011, and the Japanese investor wrote down most of it two years ago. The company, founded by IIT graduates Naveen Tewari, Mohit Saxena, Amit Gupta and Abhay Singhal, is reportedly still making losses and has never made profits. "The company's operating loss for 2015 was $40 million. In 2011, when InMobi raised funds from SoftBank the target was to cross revenue of $1 billion in three years. However, that looks impossible with the current revenue figures," said Hema Doreswamy, faculty of finance at Welingkar Institute of Management Development and Research. "InMobi's major competitors are global players like Facebook and Google, and InMobi has to fight for its share of revenue from these heavyweights." Doreswamy also said that after raising $200 million from SoftBank five years ago, Inmobi has surprisingly not gone for any big funding. "It should invest in new product innovations as it with Miip, and bring in new investors to carry out product development," she added. But industry watchers have not written off the company yet. "On the positive side, they are a technology company and hence were able to get a foothold in China in spite of Tencent being the largest player. China has a poor history of how foreign companies have fared in the market," said Singhal of pi Ventures. "The jury is still out on how InMobi will be able to handle that. With a strong team and tech DNA, hopefully, they will come out stronger in 2017."